1. All eyes on Yellen: The head of the Federal Reserve -- Janet Yellen -- is scheduled to give a speech about the state of the American job market at 1:30 p.m. ET at the University of Baltimore. Yellen may offer more clues about how much central bank support the labor market might need. Investors are trying to gauge how far interest rates may rise in 2017 after the Fed hiked rates last week. 2. Dow nears new records: Is this the week the Dow Jones industrial average hits 20,000 points? It's currently sitting at 19,843. The stock index has been flirting with that round number for a week as the market continued its stunning post-election rally. The Dow cleared 19,000 on Nov. 22. The S&P 500 and Nasdaq are also trading around their highest levels ever. 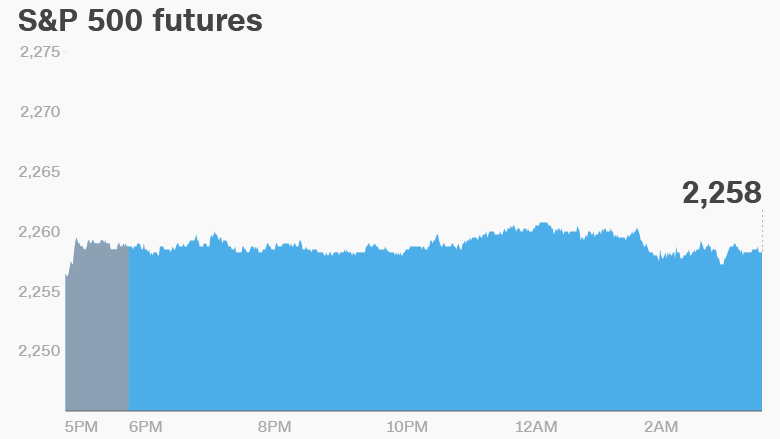 As the final full trading week of the year begins, U.S. stock futures are inching up. European markets are mostly sinking in early trade, and most Asian markets are closing the day with losses. 3. Stocks to watch -- Airbus, Nintendo, Apple: Shares in Airbus (EADSF) are dipping as Iran Air says it's not going to buy as many of the company's planes as it had originally planned in January. The original deal was to buy 118 planes worth an estimated $26 billion. Now the deal is expected to be worth just $10 billion. Shares in Nintendo (NTDOY) dropped 7% on Monday following underwhelming reviews for the new game, Super Mario Run. Nintendo's stock has dropped 11% since the mobile game's debut last Thursday. Shares in DeNa, the company that helped develop the game, have slumped nearly 14% over the same period. Apple (AAPL) is in focus as it launches an attack on the European Union's record $14 billion tax ruling. Apple says European officials singled the company out for a massive tax bill as "a convenient target because it generates lots of headlines." The company is accused of saving billions of dollars in tax by using loopholes and tax deals in Ireland. The Irish government is also challenging the EU tax ruling. 4. Let's make a deal: Canadian insurance firm Fairfax Financial Holdings (FRFHF) has announced a $4.9 billion deal to take over the Swiss insurance firm Allied World Assurance (AWH). The cash and stock deal offers an 18% premium over where Allied World shares closed on Friday.